The array of countertop surfaces is so vast we can't encompass them all on this website. Besides we focus on quality installation and maintenance, so please visit the sites of our distributors to help select your surface. We can help you find the perfect piece for your space but feel free to look around at what is available. Pacific Shore Stone - Vast selection of exotic natural stones including granite, marble, travertine, quartz, onyx and limestone. OHM - OHM International Inc. is an importer and wholesaler of high quality natural stone products. Marva Marble - Established in 1987, MARVA is an importer and distributor of world-class natural stone products and services markets in the USA. Vitoria International - Vitoria International provides a large selection of natural stone for use as kitchen and bath countertops. 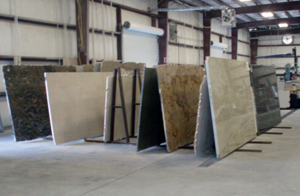 Granite Ex - For over 12 years in the Southeast market Granite Depot has been a trusted name in Granite and Marbles. Again the array of quartz surfaces is so vast we can't encompass them all on this website. Here is a list of quality distributors. Cambria USA - Cambria is a natural stone surface that is elegant and practical. Caesar Stone - A quartz surface pioneer and global leader, CaesarStone creates surface slabs that are easy to transport, fabricate, install and maintain. Silestone USA - Silestone is a sophisticated product that, by definition, is multi-dimensional in functionality and can reinvent itself. Vetro Stone - A unique quartz stone engineered with exotic seashells & sea glass! At Granite Quarry Direct we stock a large selection of sinks for the kitchen and bath. In addition to sinks, we carry spigots and accessories. Here is a sample of what's available from Levi Sink Co.
Our state-of-the-art equipment can create emmaculate edges for you countertops providing that special touch and style you are looking for. Below are the edges we are capable of.